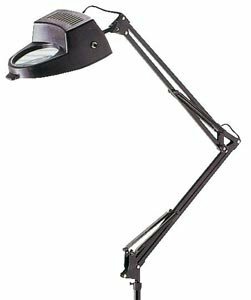 ALVINÃ‚Â® Magnifier Swing-arm Lamp…Spring suspension system for adjusting to any position. Arm height adjusts to 36 maximum. 4 diameter optically fine-ground 3-diopter glass lens with 1.75X magnification. Takes a 60W bulb (not included).